From what I can tell that will make you anything you want. For the right price they make anything. 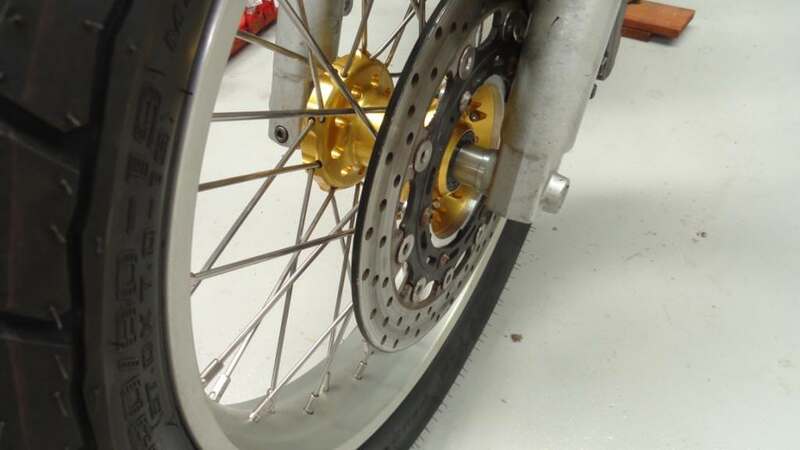 I needed a custom 520 offset 44 tooth sprocket for a cb350f rear wheel with a 7mm offset and bingo. $130 later I have it. Thanks guys, I'll give them a try. 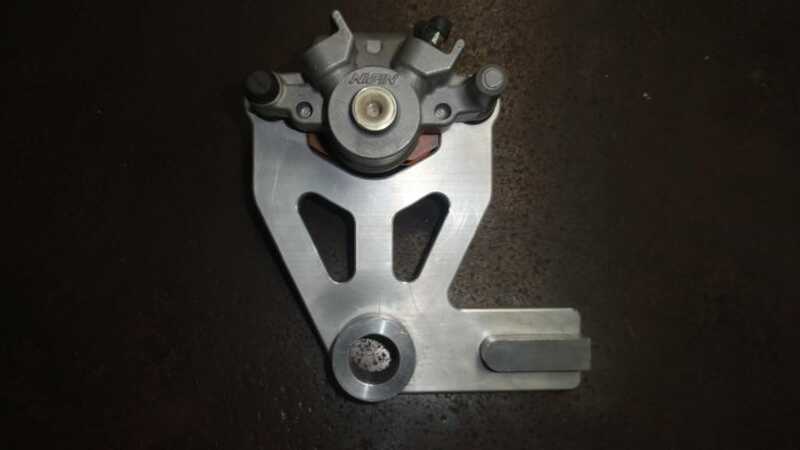 Got my rear caliper bracket made up with the new Nisin caliper. 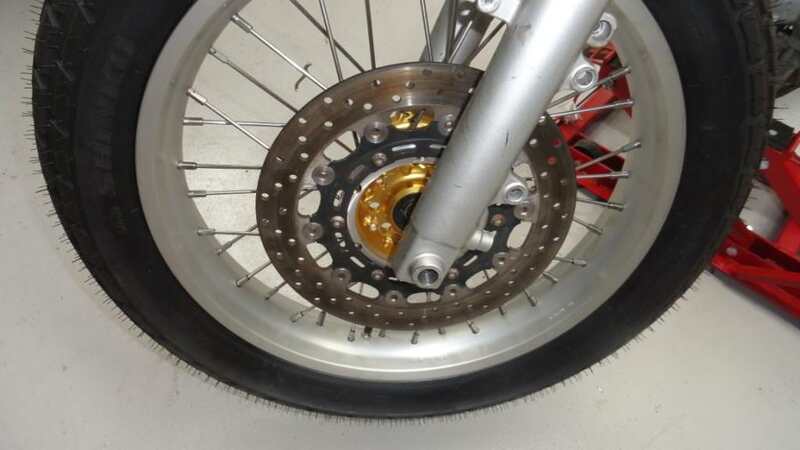 I bought an R6 front caliper but had all sorts of trouble fitting it up as it's very wide and fouls the spokes without a really wide disc adaptor, so I've gone ahead and found a good second hand 08 WR250 caliper and master cylinder. 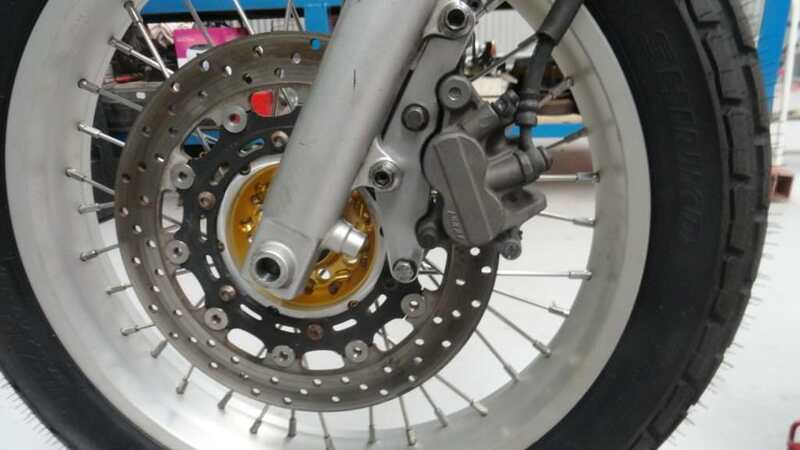 It comes complete with hose and brake light switch and although the four pot caliper from the R6 would have been good, this one should still work well, particularly with the increased diameter of the R6 disc. 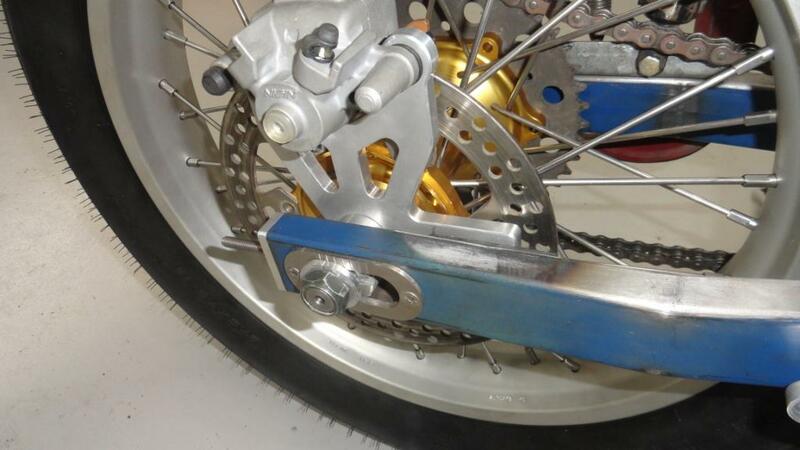 The next project will be to make a disc adaptor and then a caliper bracket once it arrives next week. It looks like a bit of an afterthought, but I really didn't have any choice and it fits up and works fine. 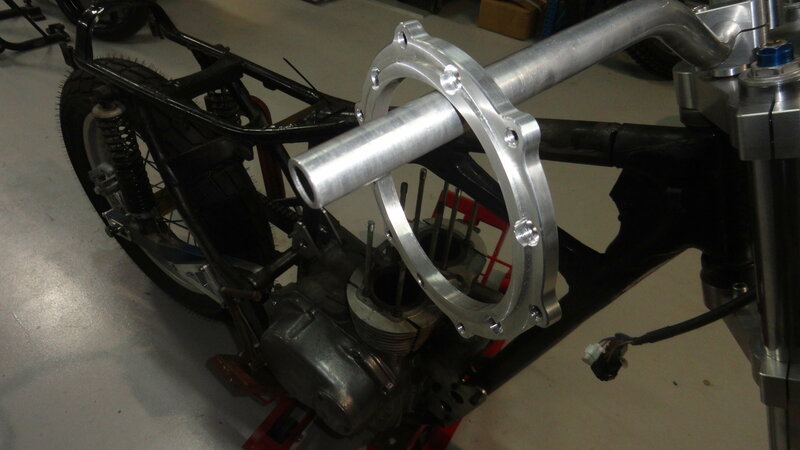 I still need to make up the front wheel spacers and then centre the wheel between the forks. I'll order the bends for the pipes tomorrow. I was going to go with two up one side, but as this bike is going to carry a pillion I'll build a two into one system and exit it on the lower right hand side, which still should look OK I think. 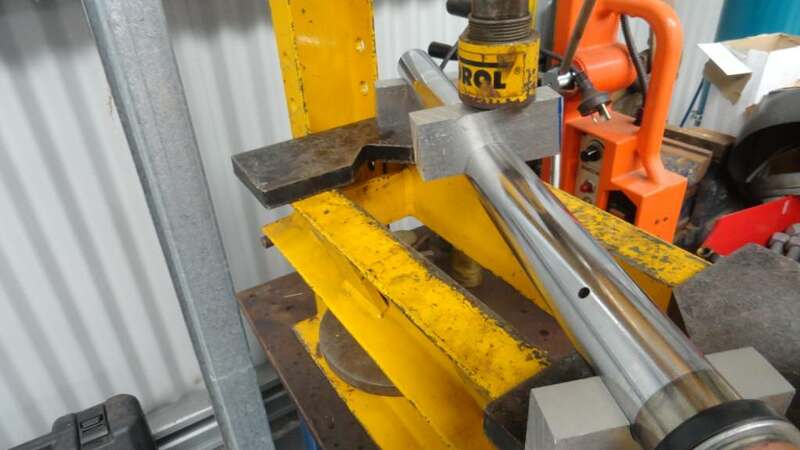 They had about 4mm of bend in them so I quickly machined up 3 cradles in the mill and very carefully straightened them. They are now within about 0.005" (sorry, always talk small values in inches), so no problem. They needed to come apart for seals and oil anyway, but I just wasn't prepared for a trial run. Once that was out of the way I made up the wheel spacers which turned out OK. 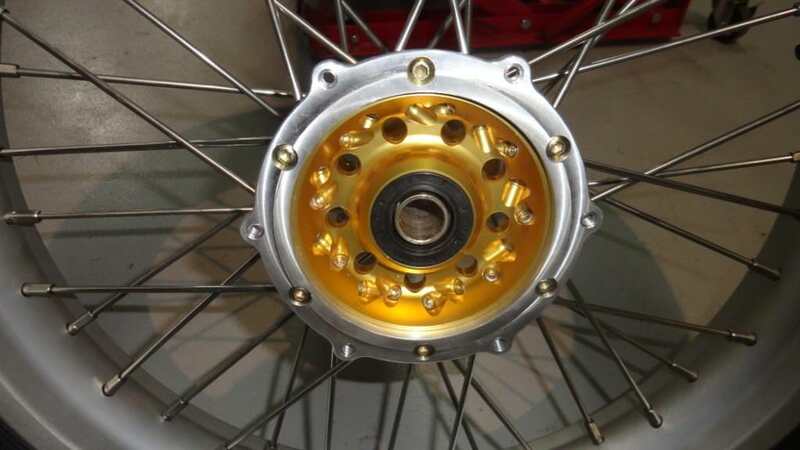 The disc is in the centre of the caliper and the wheel is in the centre of the forks, so nothing more required there. Aside from the rear shock mounts (waiting on the shocks to arrive) I now have a rolling chassis with both wheels in tight and aligned. 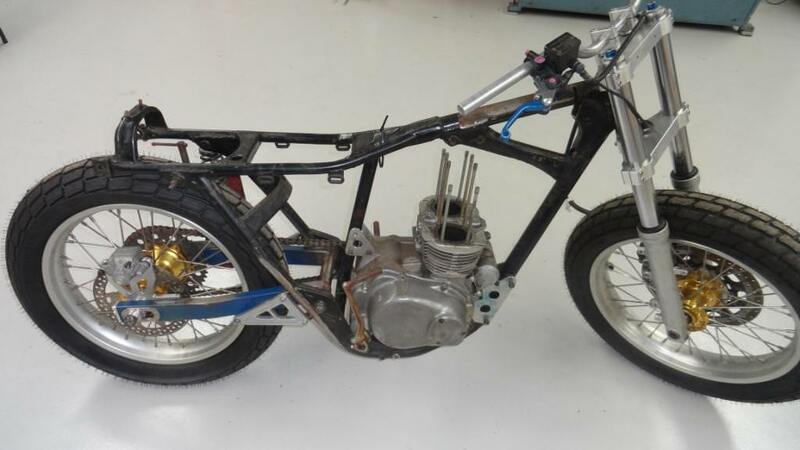 I'll build the exhaust next because I can do it on the original bike that is still together, as I want to pull the engine out and rebuild it. The footrests and brake can wait until I have the seat and tank made and in place so that I can find the optimum mounting position. Thanks for the pics of the RD. That is just awesome. The build is coming along very nicely. Do you do this for a living or is it just a hobby and where are you located? In the US? Thanks for the reply JB56. This is only a hobby, I just like fiddling with old bikes. I am in Australia. 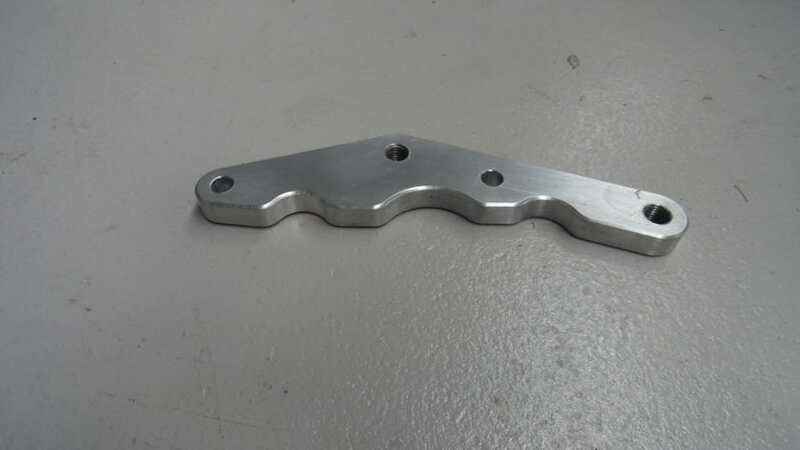 Are you CNC milling parts or manually?